Welcome to the Utah-Idaho Vizsla Rescue web site. We are a 501(c)(3) rescue organization serving Utah and Idaho. Donations are tax deductible. Whether your heart lies with the older hard to place dogs or those special "heart" dogs that have passed too soon, know that all funds donated go directly to the medical, housing and transportation needs of the dogs. We are an all-volunteer organization and each dog lives in a foster home until placed. Please feel free to look around by clicking on any of the links above. About Us will provide more information about who we are and what we do. You can look at Dogs Up For Adoption to see who needs a good home right now. To read some wonderful stories visit Success Stories. Check out Links for more about Vizslas or rescue dogs in general. On November 3rd, 2009 the UT/ID rescue team changed forever when Frank Sherman passed away peacefully. 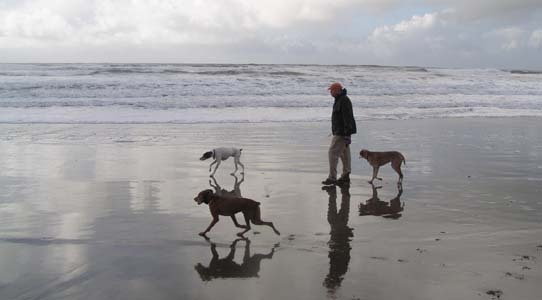 Frank was the much loved husband of Penny Fenton and a dedicated advocate for any dog that came into the rescue program. Frank came across as a tough old soul on the outside but anyone who met him knew he had a heart of gold. Frank often said dogs were 'unadoptable' but he never really believed that. The dogs just weren't adoptable by anyone but Frank & Penny. He took the dogs camping, fishing and for long runs in the fields. He and Penny could be found driving long distances on many weekends taking Vizslas and any other dogs/cats/critters that needed rides to foster or forever homes. Frank always said Penny did rescue, not him, but we knew better. Penny rescued the dogs while Frank rescued their souls.